Poaching eggs couldn’t be easier. It’s also a great low-calorie way to prepare eggs—you don’t need to use added fat to cook them, as you would with scrambled or fried eggs. Not only do eggs prepared this way make a great breakfast all on their own (with a little salt and pepper and maybe some toast), you can also use them to top a French salad Lyonnaise, bathe them in luxurious Hollandaise sauce in an Eggs Benedict, or go super healthy and serve them over sautéed greens. My favorite breakfast is one or two poached eggs, served in a bowl (they’re easier to eat with a spoon, you can catch every bite!) and sprinkled with a little truffle salt. The main trick I use when I make poached eggs is to use water that is barely simmering. Fewer bubbles means less agitation of the water that can break up and disperse the egg whites. I crack the egg into a cup first, then, when the water is at a bare simmer, gently slide the egg into the water. Some people swirl the water and drop the egg into the center. I haven’t been able to get that method to work for me, but if it works for you, great! Cracking the egg into a fine mesh sieve first is another useful method. 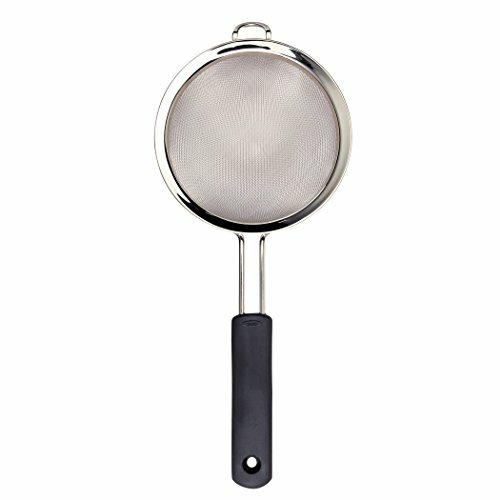 The sieve strains out some of the thinner whites that can make your poached egg look rather ragged. Do you have a favorite way of making or serving poached eggs? Please let us know about it in the comments! If you want to make a bunch of poached eggs for a crowd–say, for making Eggs Benedict for the whole family on Easter Sunday–make them ahead of time. Make your poached eggs as usual, up to five days before you plan to serve them. Immediately transfer the poached eggs to a bowl of very cold water. Top off with more cold water if needed until the eggs are cool. Transfer the eggs to an airtight container and refrigerate until needed. To reheat, transfer your eggs to a bowl of very hot tap water for 2 to 3 minutes. (Don’t use boiling water or your eggs might overcook). Top off the bowl with more hot water if needed. To serve, gently scoop the eggs out of the water with a slotted spoon, blot them dry on a paper towel, and serve immediately. More Ways to Make Eggs! Updated April 14, 2019 : We added a new video and spiffed up this post a little! No changes to the original recipe. Fresh eggs work best for poaching. Their whites hold together better than older eggs. Some people put a little vinegar in the poaching water—the vinegar helps the proteins in the egg whites coagulate. But the vinegar does affect the taste. I usually skip it. 1 Heat the water: Fill a saucepan with several inches of water. Heat the water on high until it reaches a boil and then lower the heat until the water is at a bare simmer (just a few bubbles coming up now and then). 2 Crack egg into a small bowl and gently slip it into the water: Working with the eggs one at a time, crack the egg into a small bowl or cup. Place the bowl close to the surface of the hot water and gently slip the egg into the water. If you want, use a spoon to push some of the egg whites closer to their yolks, to help them hold together. Add all of the eggs you are poaching to the pan in the same way, keeping some distance between them. 3 Turn off heat, cover pan, set timer for 4 minutes: Turn off the heat and cover the pan. Set a timer for 4 minutes (or count out loud to 60, four times). At this point the egg whites should be completely cooked, while the egg yolks are still runny. Note that the timing depends on the size of the eggs, the number of eggs in the pot, and if you are cooking at altitude, so adjust accordingly. If you are at altitude, want firmer egg yolks, or are poaching more than 4 eggs at once, you may need to cook them longer. If you try 4 minutes and the eggs are too cooked, reduce the time. 4 Remove eggs with slotted spoon: Gently lift the poached eggs out of the pan with a slotted spoon and place on a plate to serve. One way to help your poached egg whites stay together is to remove some of the thin wispy egg whites before you add your eggs to the hot water. An easy way to do this is with a fine mesh sieve. 1 Strain thin whites with a fine mesh sieve: Place the raw egg into a fine mesh sieve over a bowl. The very thin egg whites will drain out through the sieve. 2 Gently add to hot water: Then gently ease the raw egg into your pot of simmering hot water. Remove from the pot with a slotted spoon. 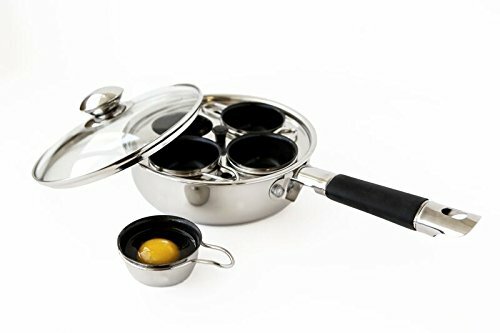 If you don't want to futz around with trying to keep the eggs from spreading or bumping into each other, the easiest way to make poached eggs is with an egg poacher. The "poacher" is actually coddling the eggs, not truly poaching them, but if what you want is an egg with a cooked white and runny yolk, this is an easy way to do it. To use an egg poaching pan, remove the cups from the pan that you intend to use. Crack the eggs into the egg cups, one egg per cup. Place the egg filled cup back in the slot for it in the pan. Cover the pan and cook for 4 minutes. Remove from heat and carefully lift the egg cups out of the pan. Slide the cooked eggs out of the cups onto serving plates or bowls. Hello! All photos and content are copyright protected. Please do not use our photos without prior written permission. If you wish to republish this recipe, please rewrite the recipe in your own unique words and link back to Easy Poached Eggs on Simply Recipes. Thank you! Hi! Just found your website. It’s fantastic! I’ve tried quite a few different approaches to poaching an egg, but this one, first try, worked better than every other. I poached four eggs following your instructions, and they came out perfectly cooked, i.e., nice runny inside, firm outside. The strainer really reduced the amount of “fly away” strands. I did this with my son who is learning the basics of cooking, and he was amazed at how easy it was. Thanks very much! Thank you!! The strainer method worked perfectly and I finally succeeded in making poached eggs! I’ve tried the whirlpool before with disastrous results, so I’m very happy to have found a simple and effective alternative! The strainer worked great. I didn’t need to use vinegar and I didn’t have any of the yucky vinegar taste. Best poached eggs I’ve ever made. So glad it worked for you Rebecca! Best how to guide for poach eggs 4 minutes works really well. I achieved perfection after three trial and error. You see what works best for you. Water calculation based on pan size is important. I gently set the egg down out of the heat area cause I don’t want the bubbles moving eggs as quickly and gently as possible then put pan back into the simmer heat area covered with a clear see through cover start 4 min timer on iPhone. If you wish you can add mint leaves or herbs healthier also. Thank you very much. Best recipe for poached eggs I’ve come across! Using the strainer was key as was simmering water not boiling, added 2 eggs, used a small pot with cover and in less than 2 minutes they were perfectly poached! I strain out the loose white and have beautiful poached eggs. Thank you for the recipe!! This was my first time cooking poached eggs and they turned out great! This is a great, easy recipe. I just slid the egg into the simmering water (after it came to a boil) from a small bowl, covered, removed pot from heat but let sit for about 3 & 1/2 minutes instead of 4. I poached 4 eggs this way in a bigger pot and they were perfect! Thanks for teaching me how to poach an egg! Super easy and always works. Thx! Same issue as Bob- did not cook though and white was all runny. Hi EJ, make sure you bring the water to a full boil before reducing the heat to a bare simmer. Also, if you are poaching more than one egg, make sure you have several inches of water in the pan. Hi Bob, did you cook more than one egg at a time this way? If so, you likely did not have enough water in the pan to retain the heat to cook the eggs. Make sure to bring the water to a rolling boil first, then reduce it to a simmer. Perfect. Straining the Eggs and Calm Water is the key. I will put mine in one of those silicone baking cups. then just eat it right out of the cup. It makes clean up so much easier, just remember to coat the cup with cooking spray first. Try poaching the eggs in milk. Then pour the poached eggs and milk over a bed of toast. Salt to taste. Poor man’s Eggs Benedict. There a running joke in my family that I could burn water. Well, now I can, and have, make perfect poached eggs! Thank you so much!! Wow! What a cool thing to finally make a decent poached egg! The stirring method never worked for me and the pot was always a nightmare to clean afterward. Thank you.